Team Fortress 2 Is Now Free. Free Forever. If you've waited this long to finally play a game of Team Fortress 2, now may be the best time. Or at least the cheapest, as Valve is giving Team Fortress 2 away for free—forever—with the team-based first-person shooter now solely supported by microtransactions. Valve's Robin Walker tells Develop that Team Fortress 2 won't fund its continuing development with advertising or subscription fees, just the things players spend their real-world money on right now (hats, new weapons, crate keys and other virtual goods). Walker says that free drops of in-game loot will continue as it has, now that the game is free to play, as will the sharing of profits with community members who create content for TF2. One of the bigger benefits to Valve of TF2 going F2P is attracting more people to Steam, the developer's digital distribution and community service. And more players means more people willing to invest in items from the game's Mann Company store, more people willing to put cash in their Steam Wallet and spend elsewhere. While other games in Valve's catalog have in-game stores, like Portal 2, Walker downplays the notion that other games from the developer will adopt a free to play model. So, who's finally jumping in? We could use a few more Medics. Update: The official Team Fortress 2 site lays out some of the changes in store for the transition to free to play. Perhaps the most notable change is the distinction between Free and Premium accounts. A Premium account, according to Valve's FAQ, is for anyone who has ever spent money on Team Fortress 2, whether it was an initial purchase or buying something from the in-game Mann Co. store. Premium account holders have benefits that Free accounts don't, like larger backpacks, access to all crafting blueprints, the option to wear rare and cosmetic items, and the ability to give items as gifts. 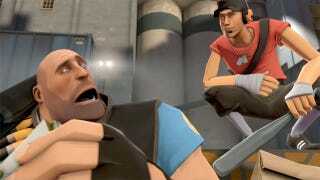 More at TeamFortress.com.